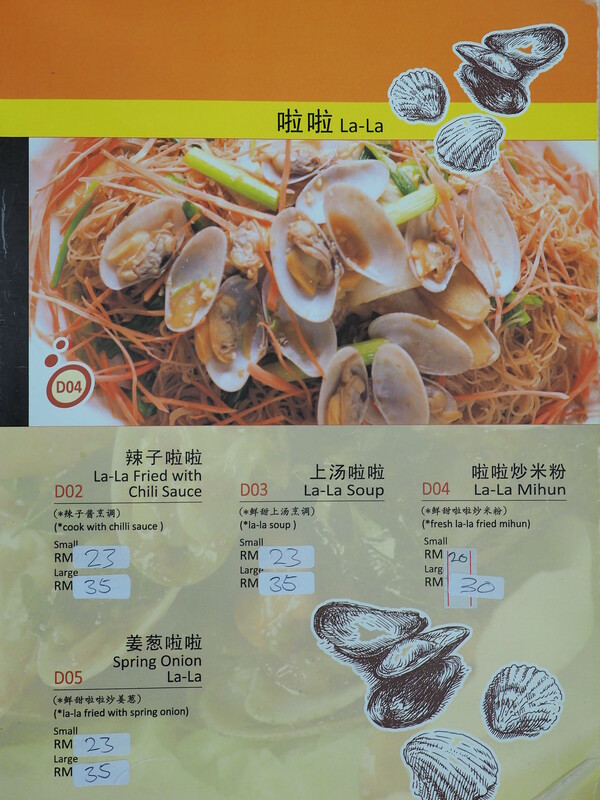 Pangkor Village Seafood Restaurant at Taman Megah is one of our favourite Chinese restaurant in Petaling Jaya. 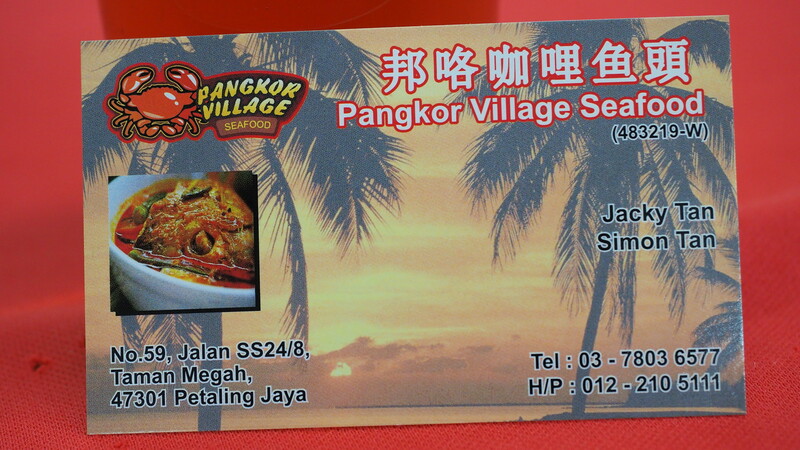 It is named as Pangkor Village Seafood Restaurant because the owner’s hometown is in Pangkor. But, the seafood is not sourced from Pangkor. Some of them are from local suppliers and some are from Indonesia such as the fish heads and crabs. We ordered Sweet and Sour Crab as it is highly recommended by the waitress at the Pangkor Village Seafood. 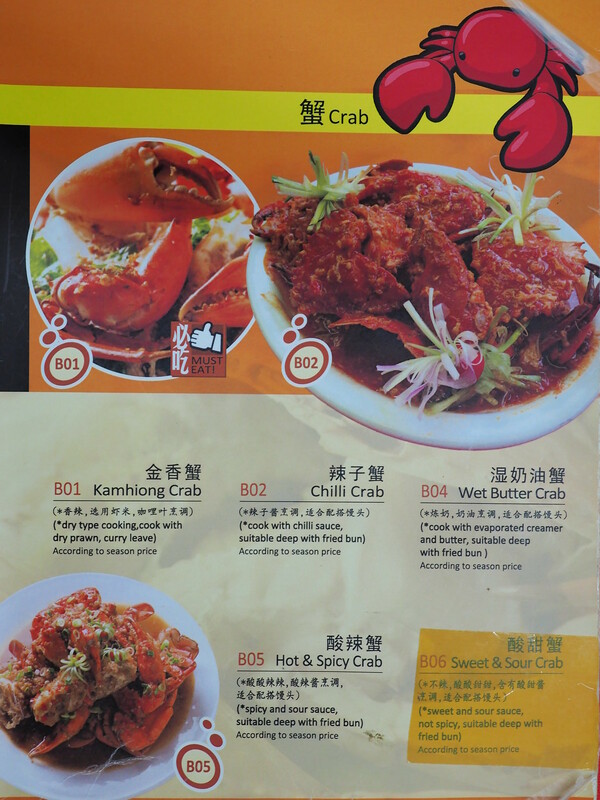 They have Chili Crab as well but we wanted something that is not spicy. The Sweet and Sour Crab here is one of the best I have tasted. The gravy goes very well with the fresh crab meat. 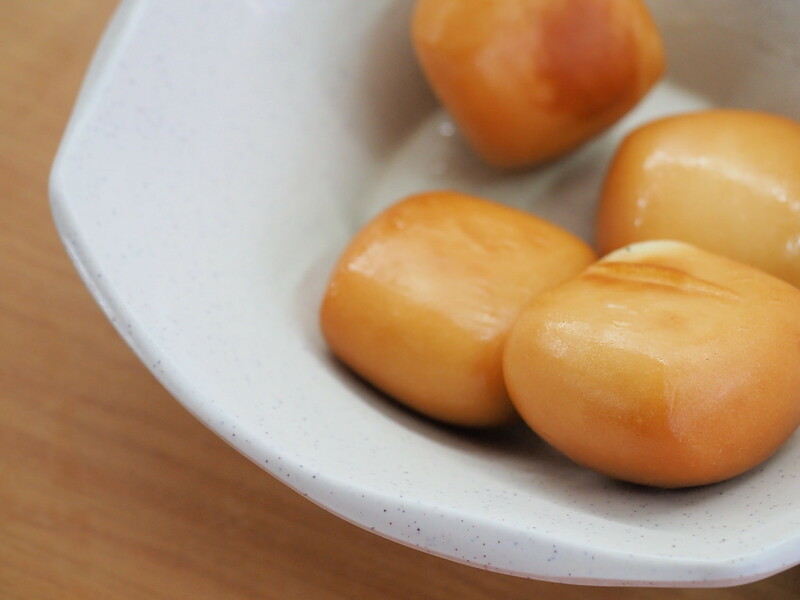 Don’t forget to order the bun to be dipped into the Sweet and Sour Crab gravy as well. Another photo of the Sweet and Sour Crab, showing the crab’s claw. Which part of the crab is your favourite? The claw, the body or the legs? Shot another photo of the Sweet and Sour Crab before moving on to another crab style. The next crab dish we ordered is this Salted Egg Crab. 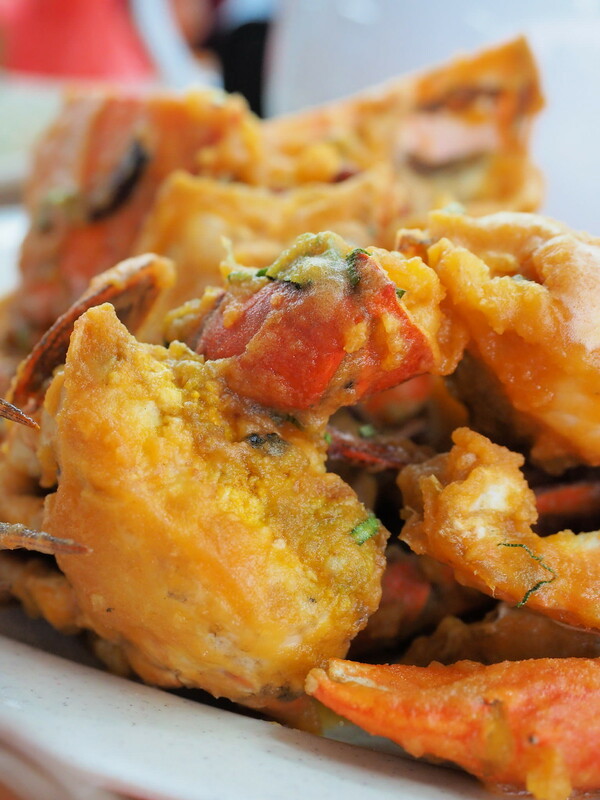 Salted Egg Crab style is always our favorite style of crab cooking. 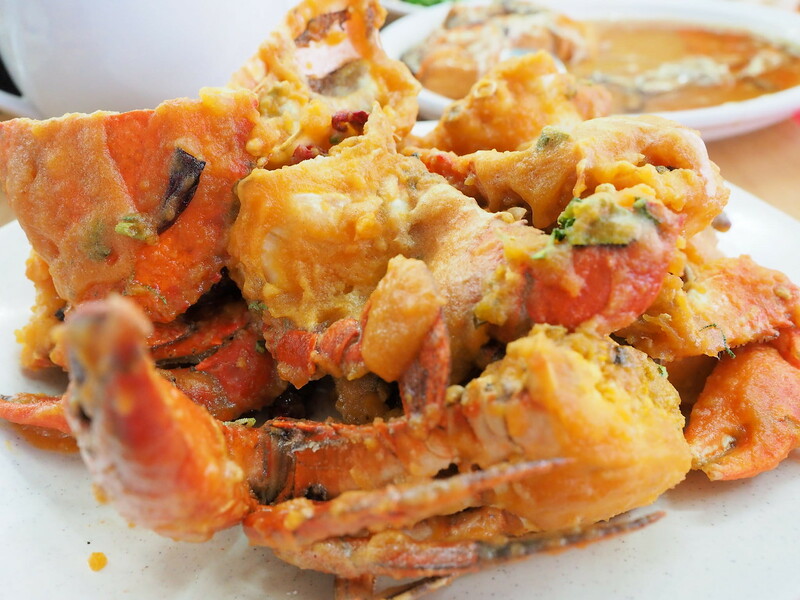 The Salted Egg Crab at Pangkor Village Seafood does not disappoint. The Salted Egg Crab is generous with the amount of salted egg. 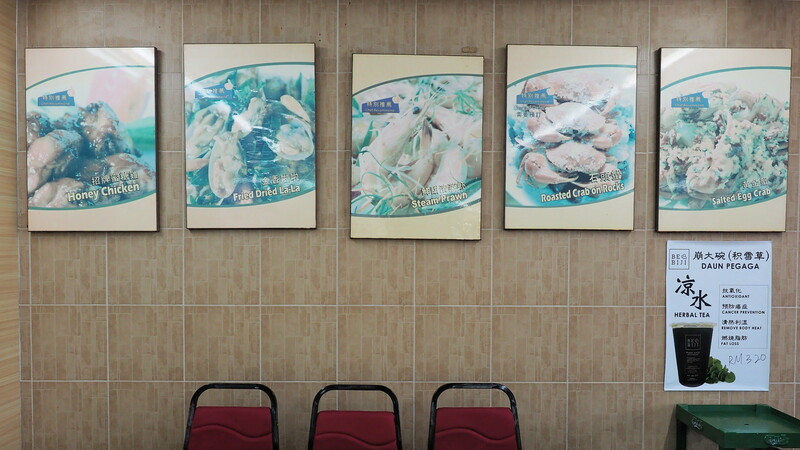 Another place for yummy Salted Egg Crab will the at Green View Restaurant (长青海鲜饭店), which I have blogged a while ago. Another angle of the Salted Egg Crab, showing the crab claw. So delicious until we licked the shell clean. The salted egg is blended very well into the crab’s body. 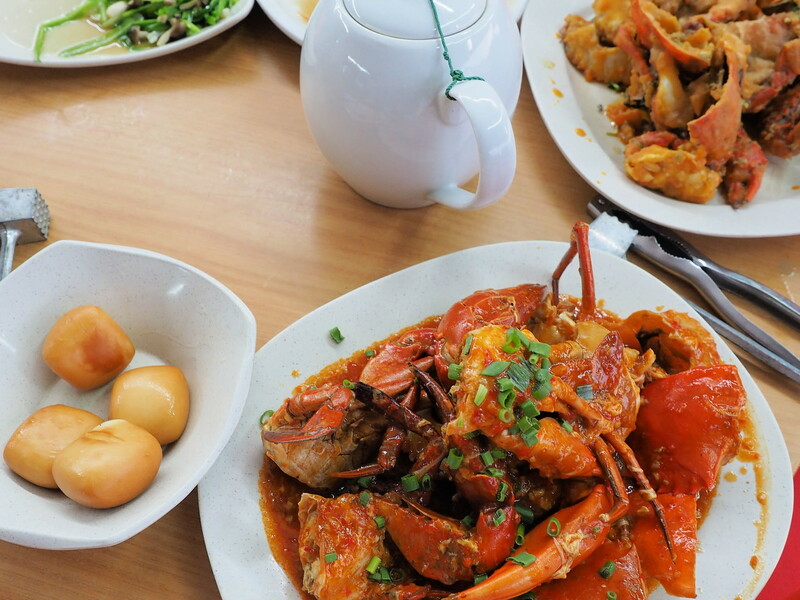 Every bite is a goodness of salted egg with the crab meat. Overview of our dinner table with Sweet & Sour Crab and fried bun to be dipped into the tasty gravy. Two types of crab tools are provided for your convenience, the crab hammer and the crab crusher. 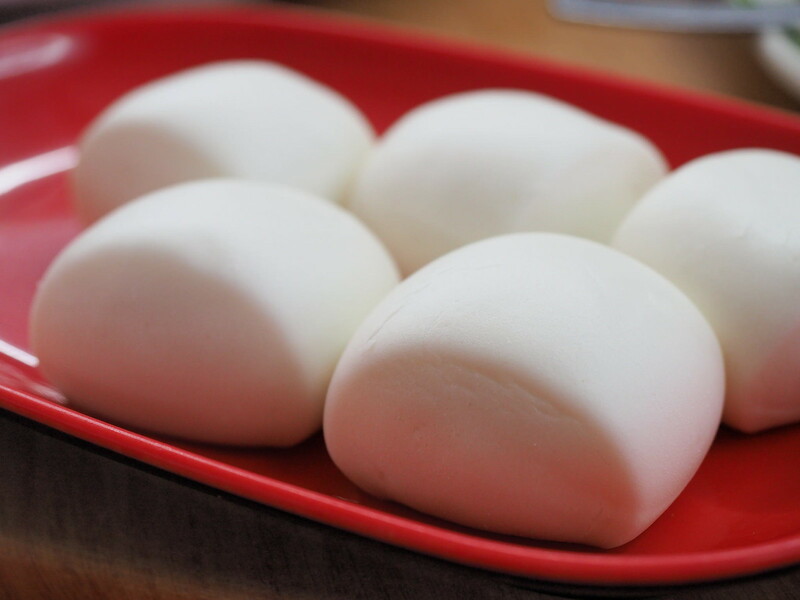 Steamed white bun is available here besides the fried version to be dipped into the Sweet and Sour Crab gravy. The buns here are very nice to be eaten on its own as well because of the freshness. The fresh fried buns for crab gravy dipping. It is very nice to be eaten on its own as well as it is crunchy on the outside and very soft on the inside. 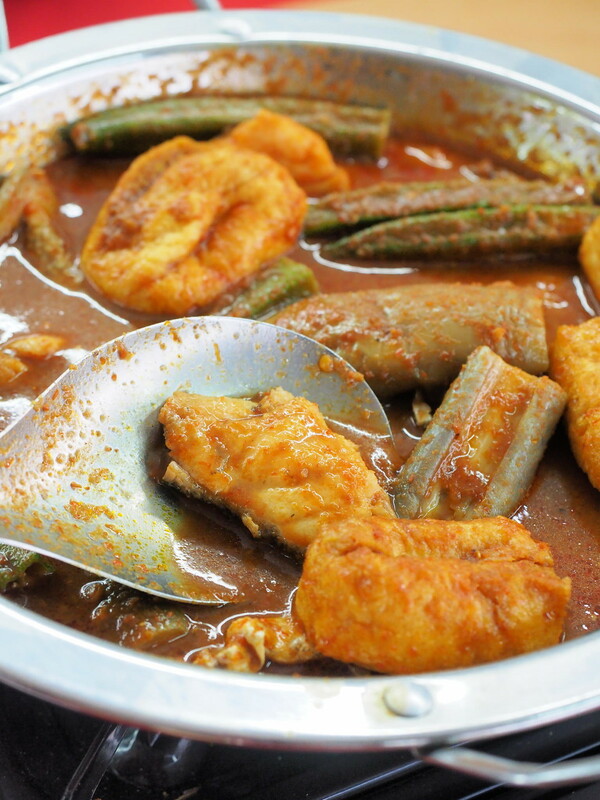 Another recommended dish here at Pangkor Village Seafood is their signature Curry Fish Head. We asked for fish slices instead of fish head. 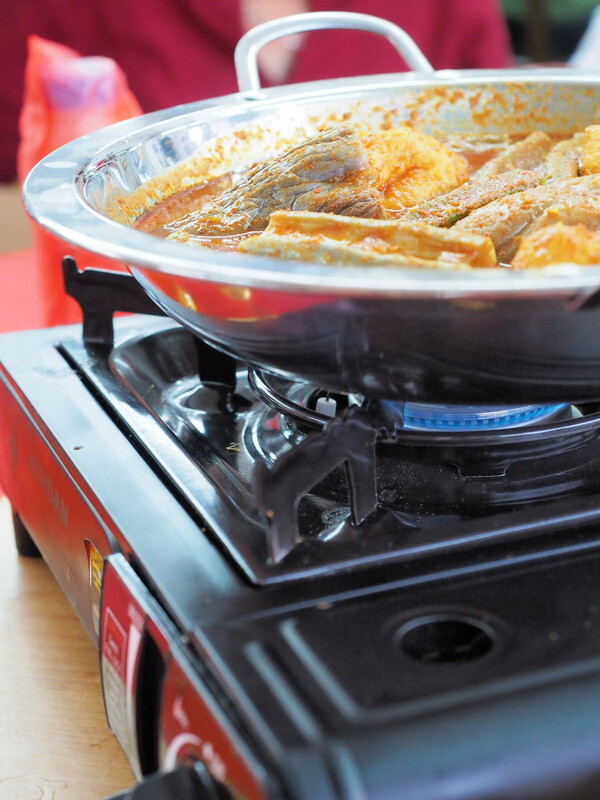 The flavourful Curry Fish Head is served with this portable gas stove to keep it hot throughout our dinner. 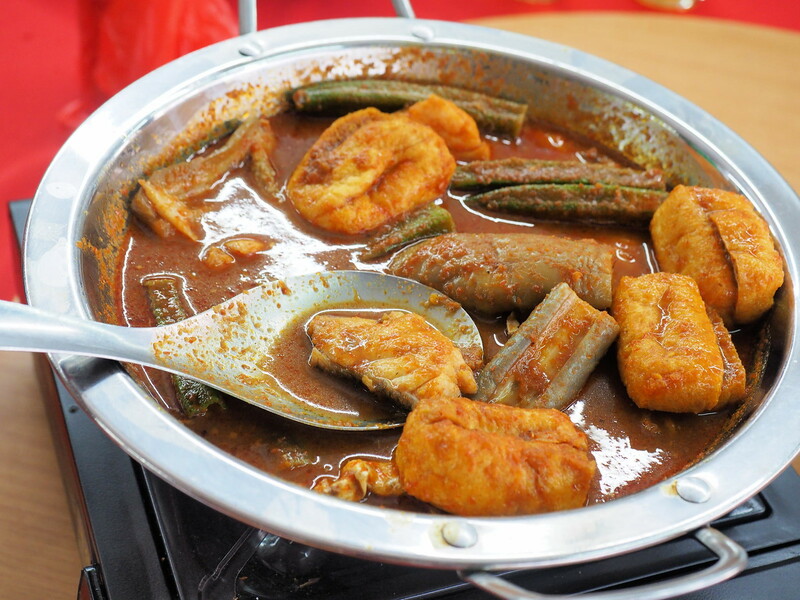 The Curry Fish Head comes with tofu pok, lady fingers and brinjals. We ordered a small size only as we ordered many other dishes as well. Took a photo of the juicy and big pieces of brinjal from the Curry Fish Head. 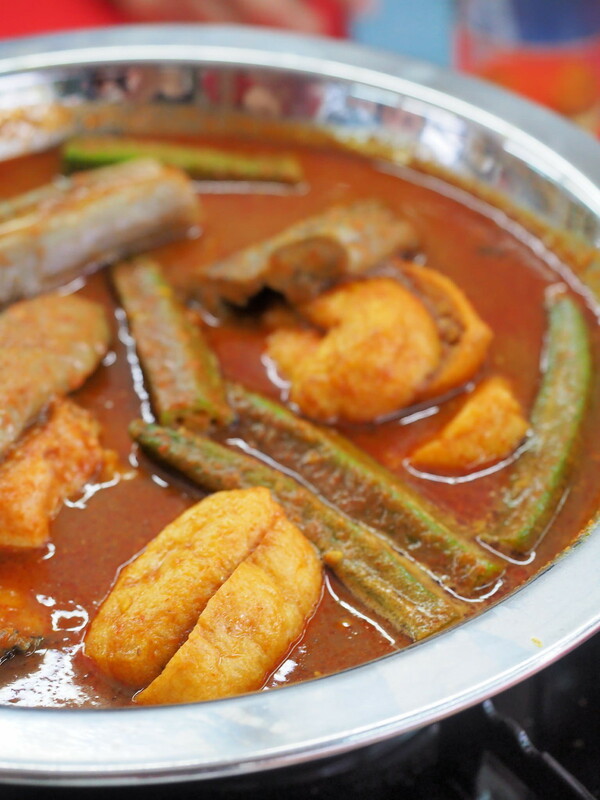 Big and fresh cut of fish slices from Pangkor Village Seafood’s Curry Fish Head. From here you can see the Curry Fish Head ingredients are cut into big pieces. 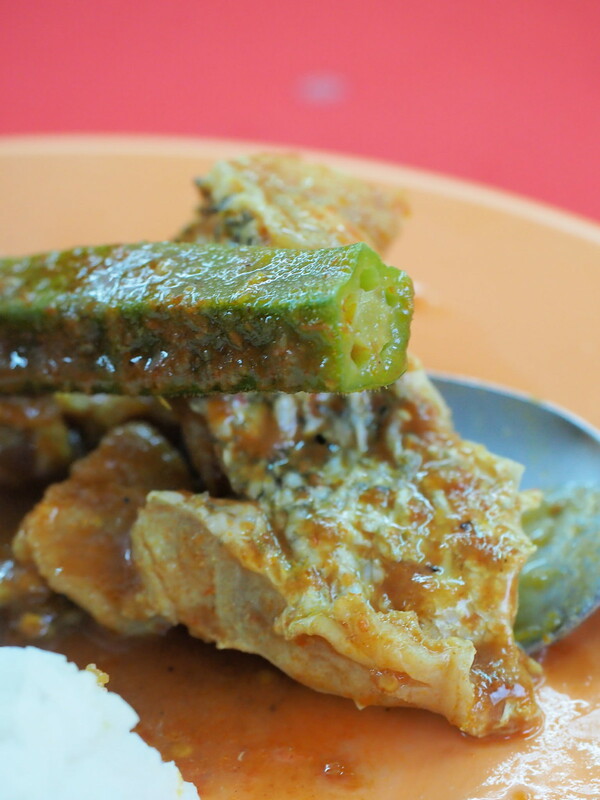 Okra / lady finger from the Curry Fish Head. Very juicy with the curry flowing into you mouth. Fish slice from the Curry Fish Head, very fresh and delicious. 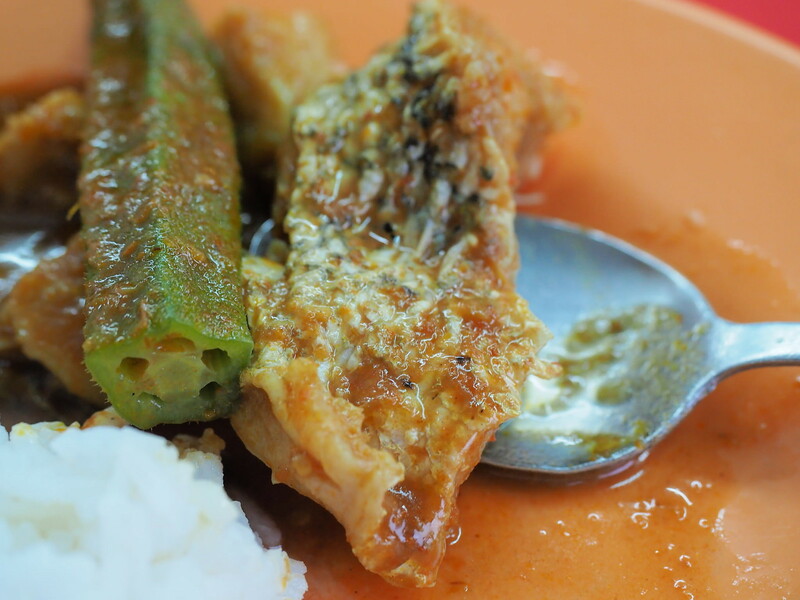 For the dinner, we also tried their steamed Patin fish. The fish is very fresh as well. We ordered soya sauce steam so that we can taste the sweetness of the fish meat. 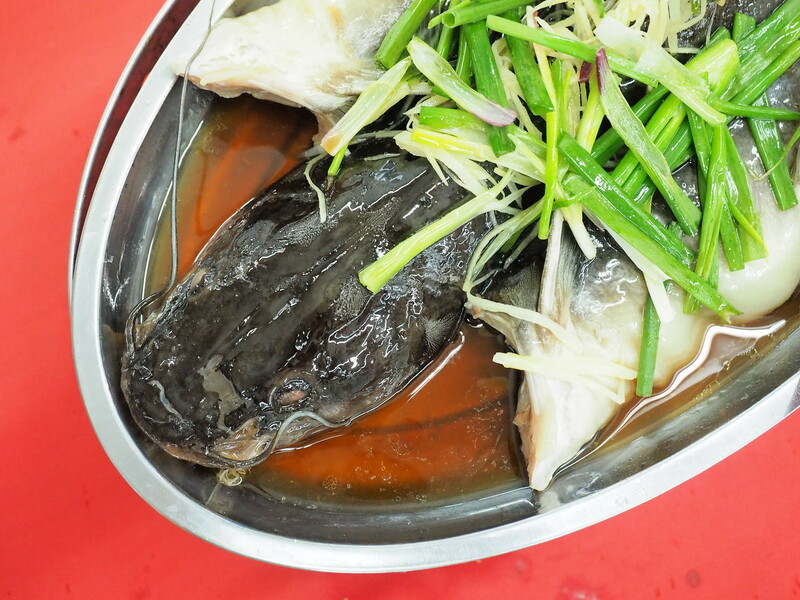 Took another photo of the steamed patin fish. 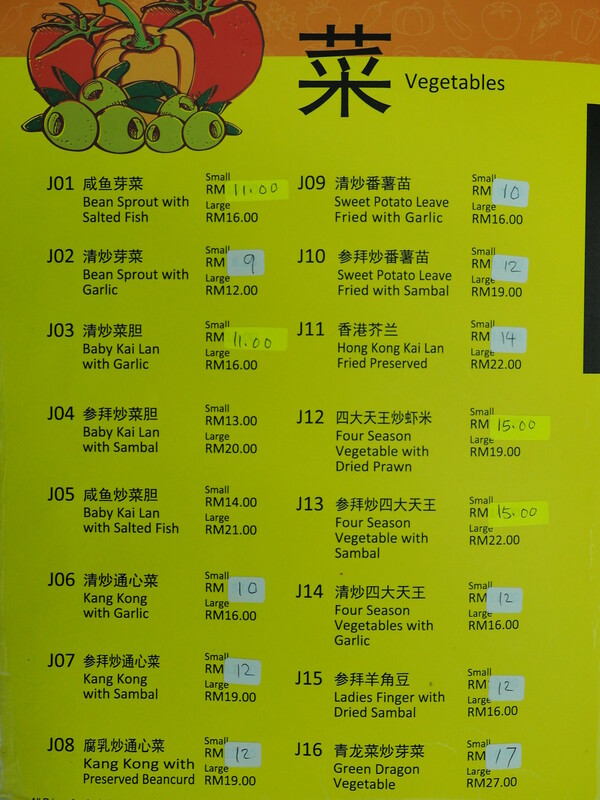 We also ordered Sambal Petai Prawn at Pangkor Village Seafood, RM 18 for a small size. 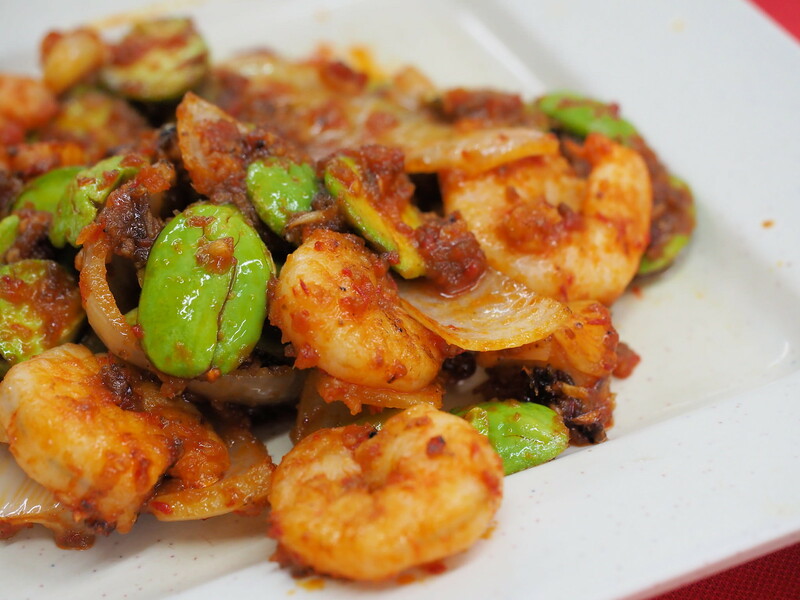 Pangkor Village Seafood’s Sambal Petai Prawn is very delicious as well. 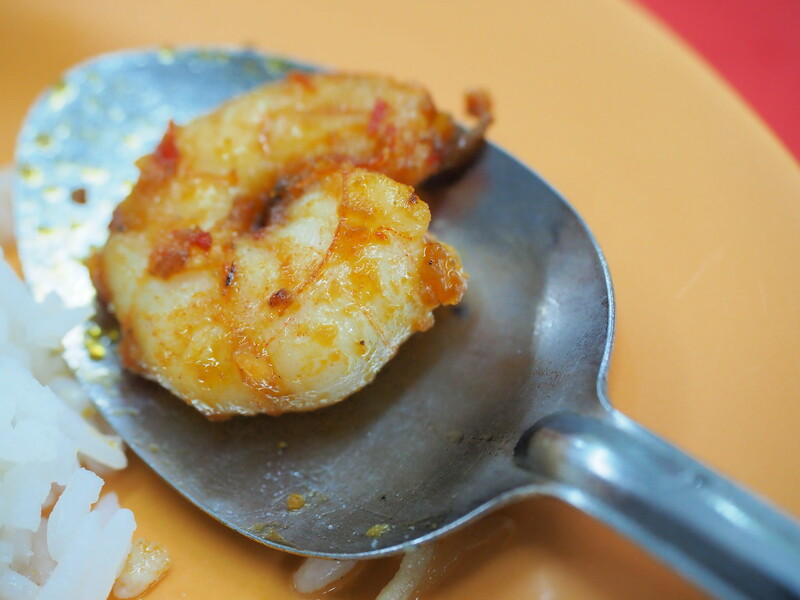 Look at the size of the juicy prawn from the Sambal Petai Prawn. The lala used for the lala soup is pretty juicy and fresh. 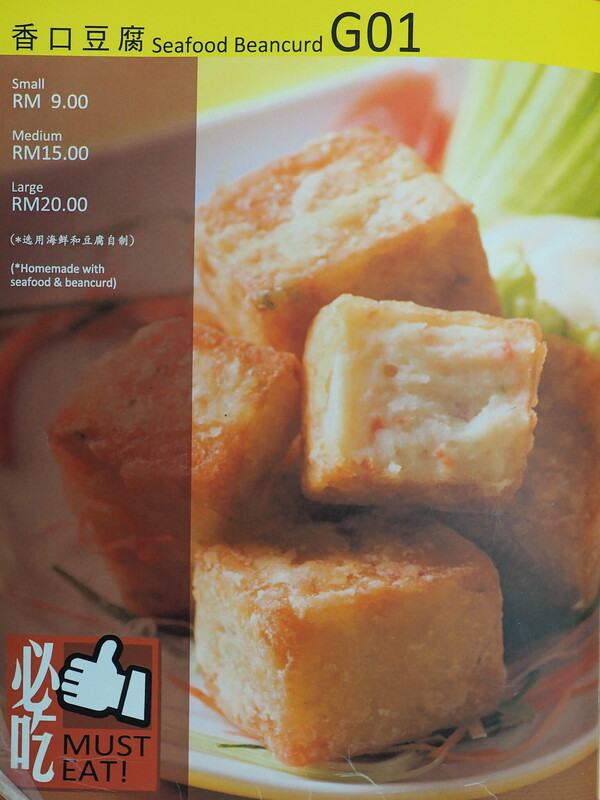 Seafood Beancurd / tofu is another must order from Pangkor Village Seafood, Taman Megah. A small portion cost RM 9. 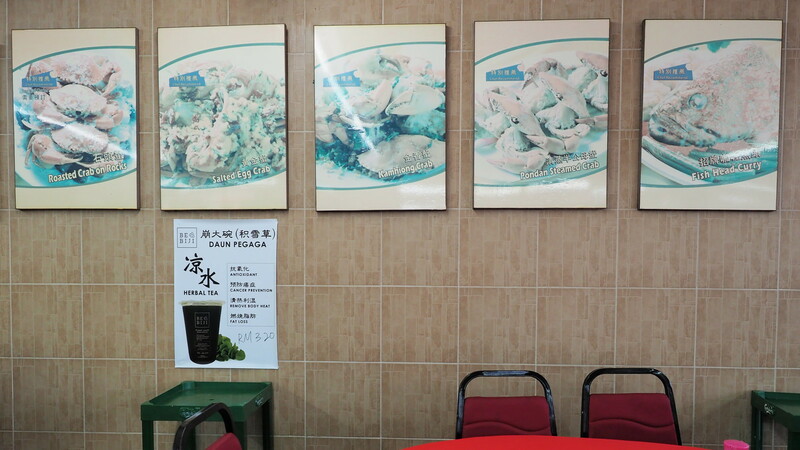 The seafood beancurd is yummy and has interesting texture. Each bites make me want to bite more. The fuyu (fermented tofu) Sweet Potato Leave here is really delicious. One of the best we have tried among all the Chinese Restaurants. 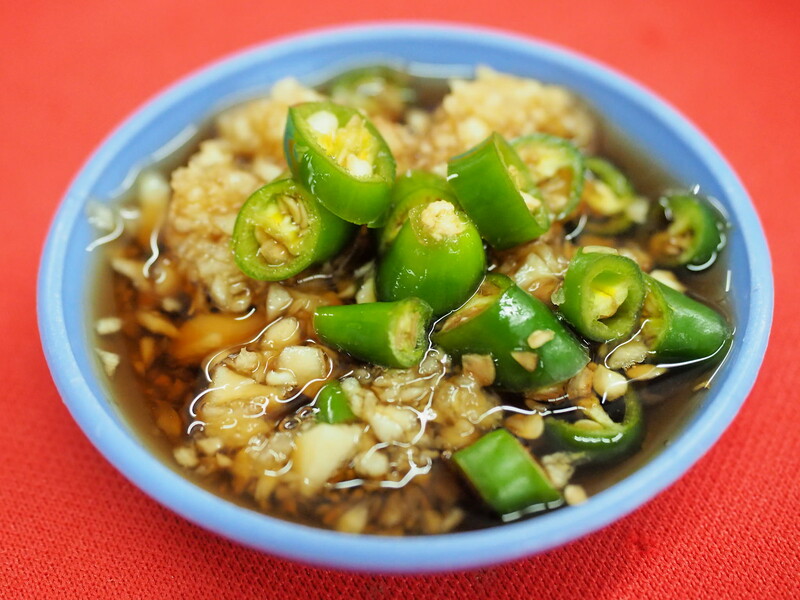 We always like to prepare the chili and garlic soy sauce to enhance the taste of the food. But, if the food is really tasty, the chili and garlic sauce will be left untouched. 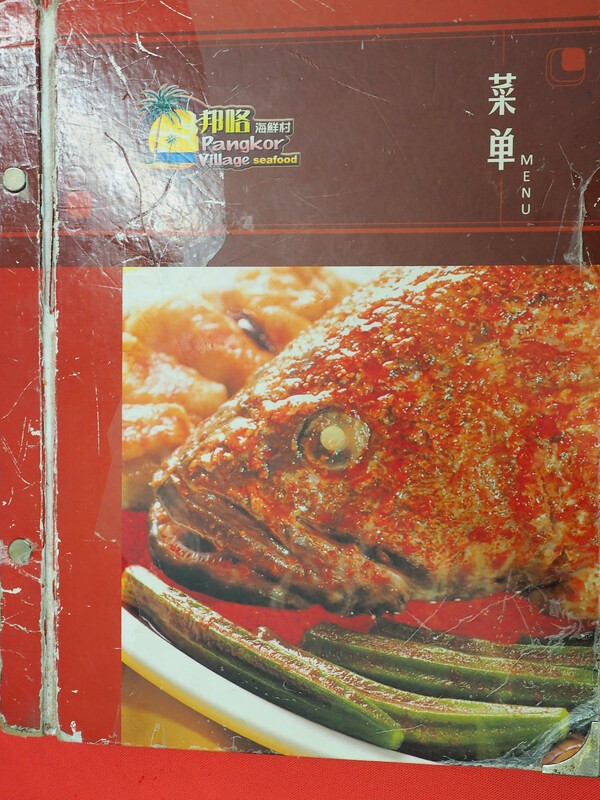 The cover of the food menu here, featuring the signature Curry Fish Head dish. 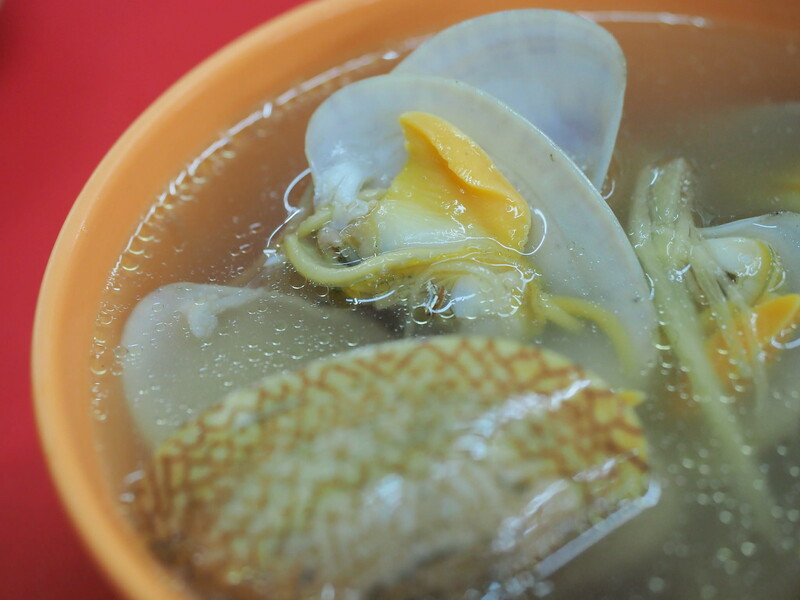 Another specialty of Pangkor Village Seafood is this Steamed Pondan Crab. What an interesting name for this dish. 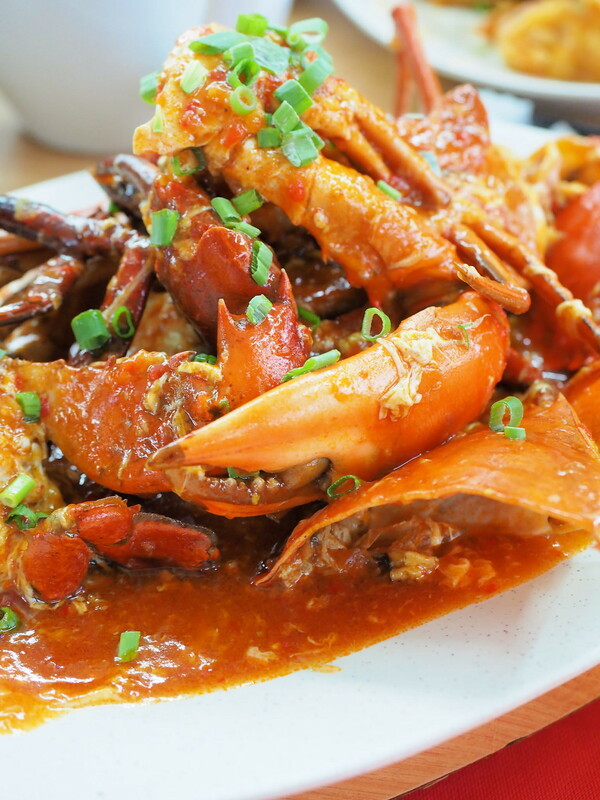 According to an article on The Star Online, the dish is called Steamed Pondan Crab because the crab is caught during the period of shell-changing. 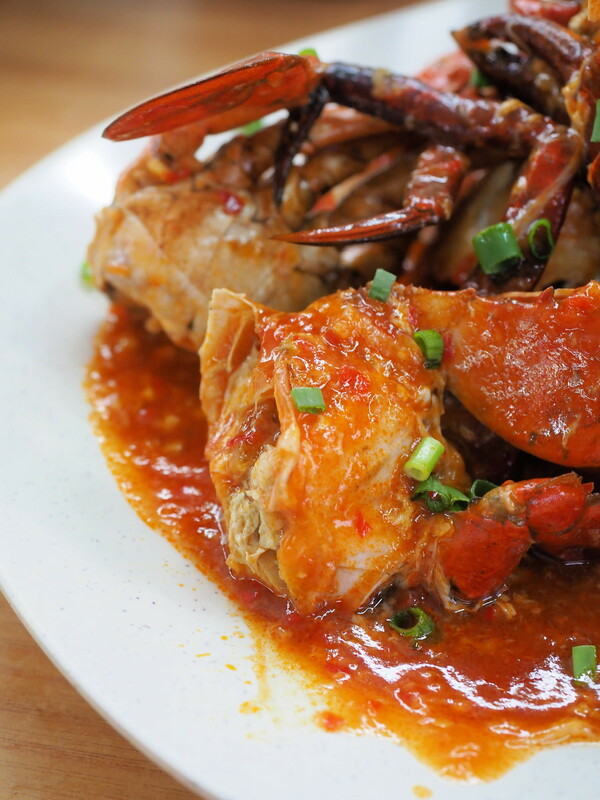 The Steamed Pondan Crab has delicious crab roes, and the meat is firmer and sweeter as well. It is perfected with a dash of rice wine only as other condiments or sauce might interfere with the natural taste of the crab. Perhaps can try this for our next visit. 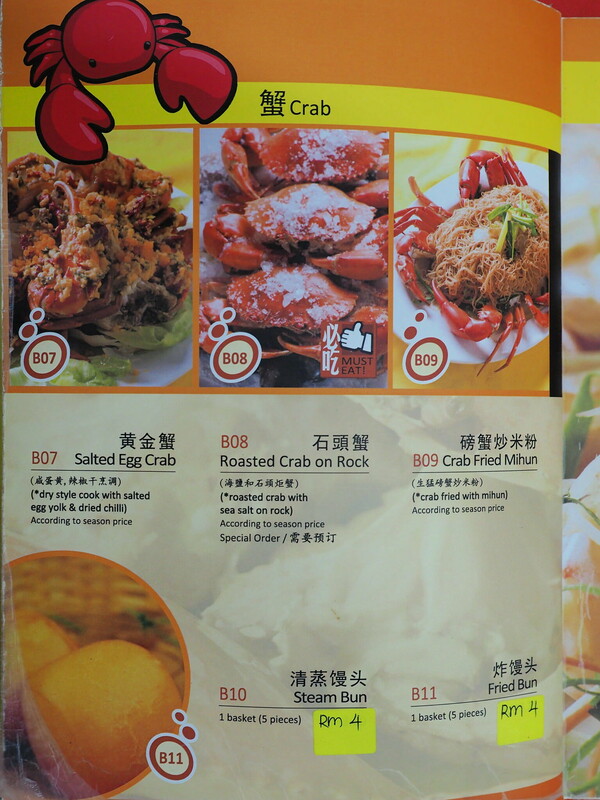 Five types of crab cooking style of this page of their menu. 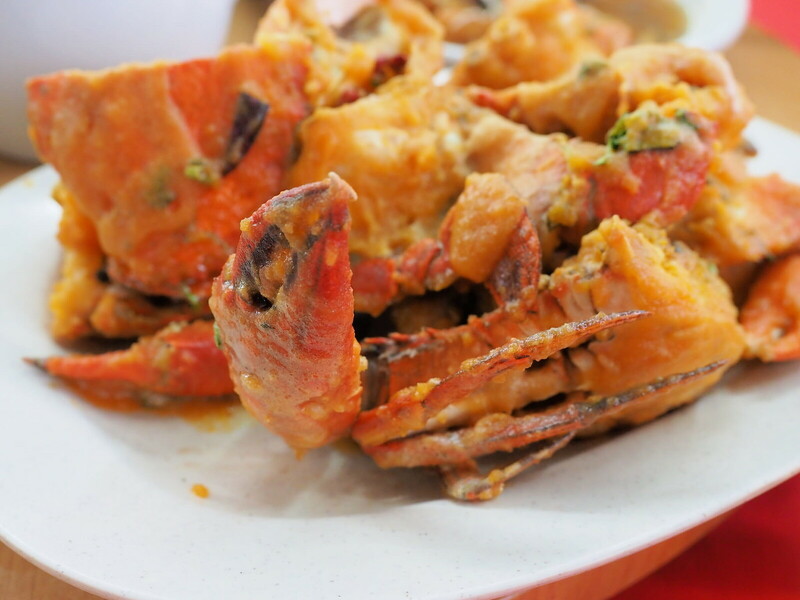 Pangkor Village Seafood has Kamhiong Crab, Chili Crab, Wet Butter Crab, Hot & Spicy Crab and Sweet & Sour Crab. All are according to season price. 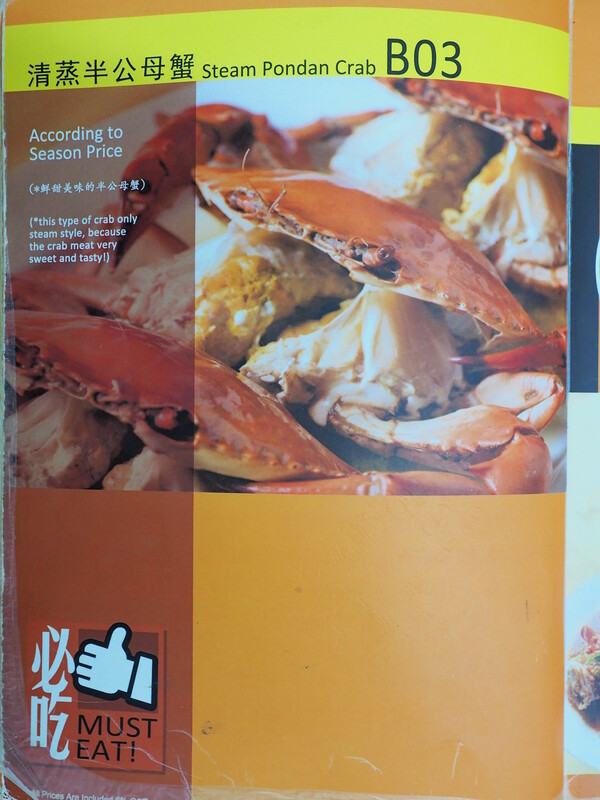 The next page of the menu shows 3 more cooking styles for the crab. The Salted Egg Crab which we ordered, Roasted Crab on Rock which is using sea salt. 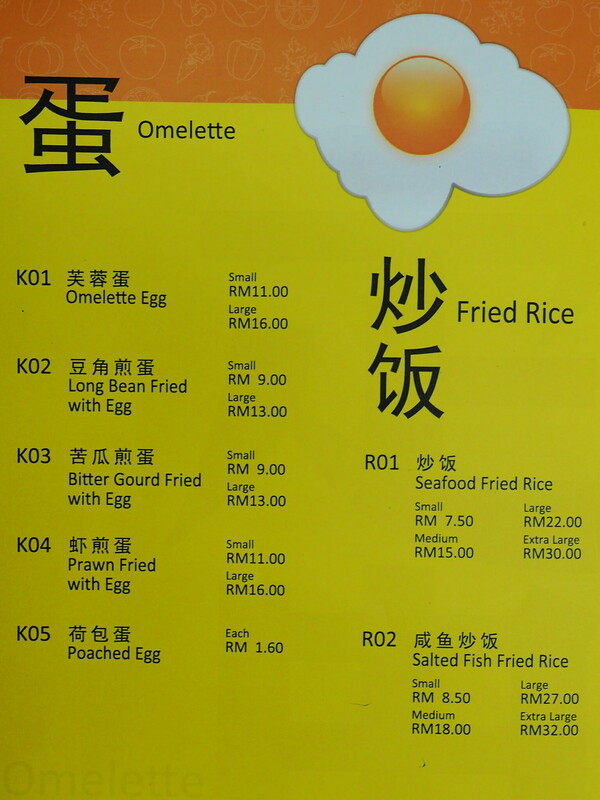 You can also order Crab Fried Mihun if you do not want to eat white rice. 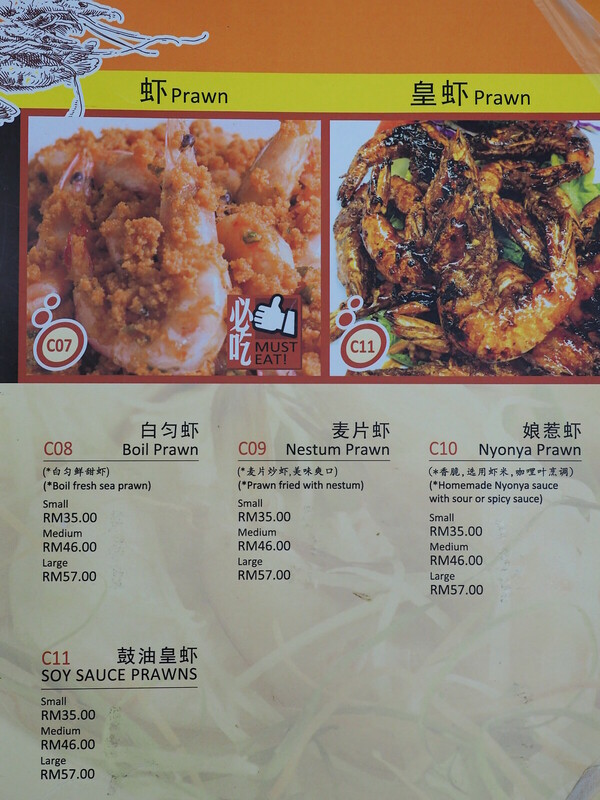 After the crab, the next seafood choice will be the prawns. 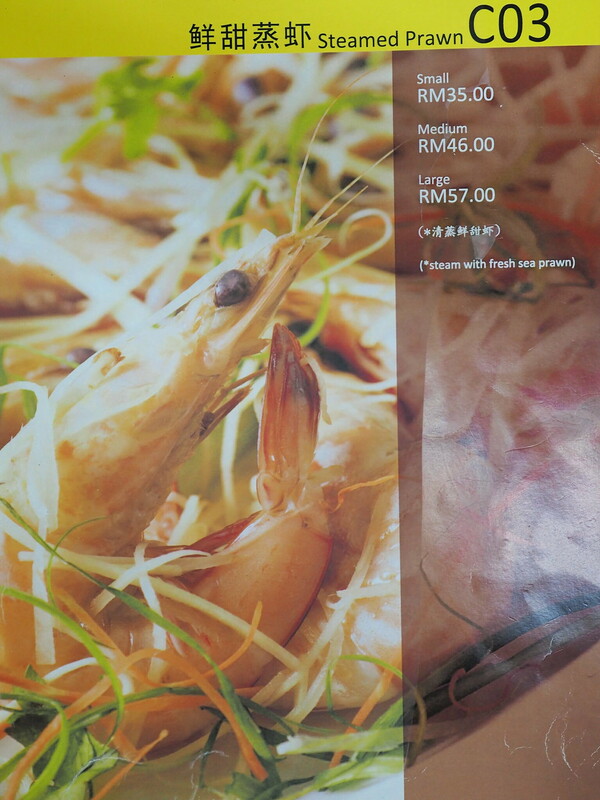 Steamed prawn is featured on full page here, so I guess it must be their must order dish. 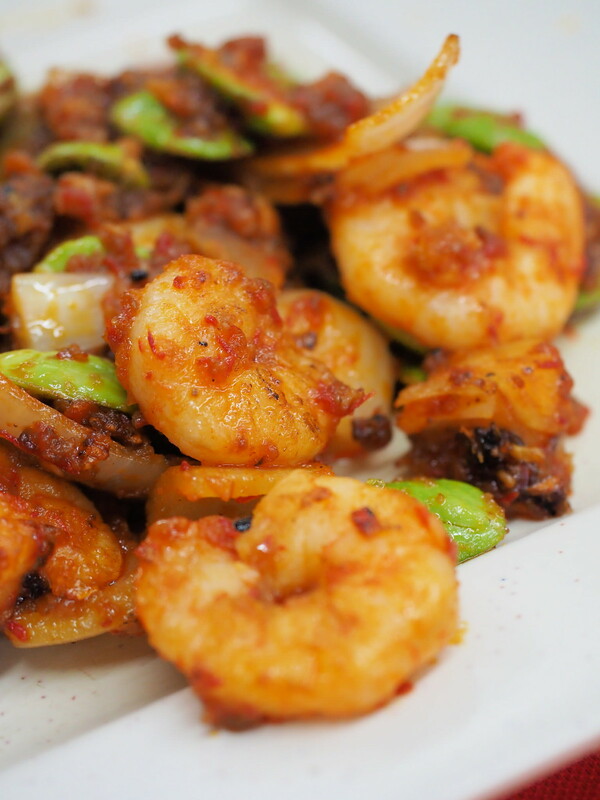 Other prawn cooking styles are Kamhiong Prawn, Teppanyaki Sambal Prawn, Wet Butter Prawn, Dry Butter Prawn, Deep Fried Prawn and Salted Egg Prawn. 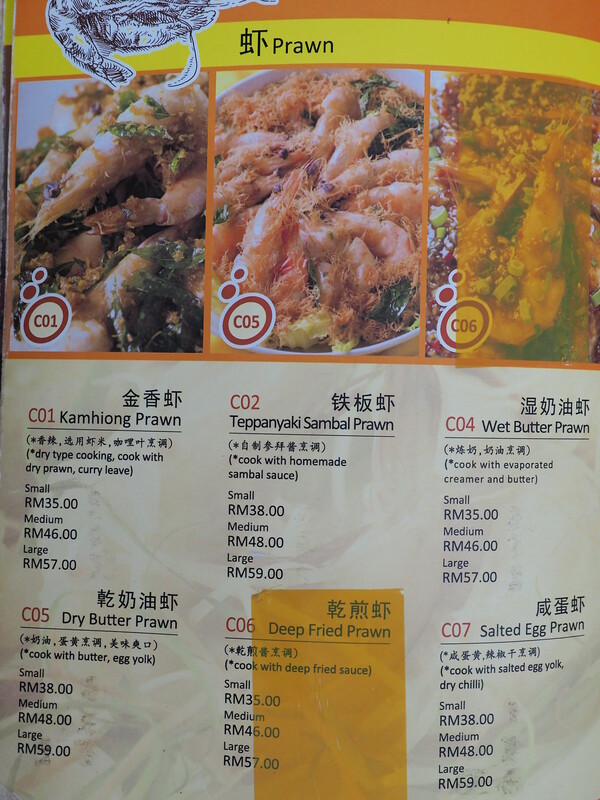 There are so many types of prawn cooking styles here at Pangkor Village Seafood. The last three are Boil Prawn, Nestum Prawn, Nyonya Prawn (Homemade Nyonya sauce which is sour and spicy) and Soy Sauce Prawns. After the crabs and the prawns, lala is next. Featured full page in the menu here is the Kamhiong Lala. Kamhiong Lala Prawn is dry types and cooked with curry leaves. 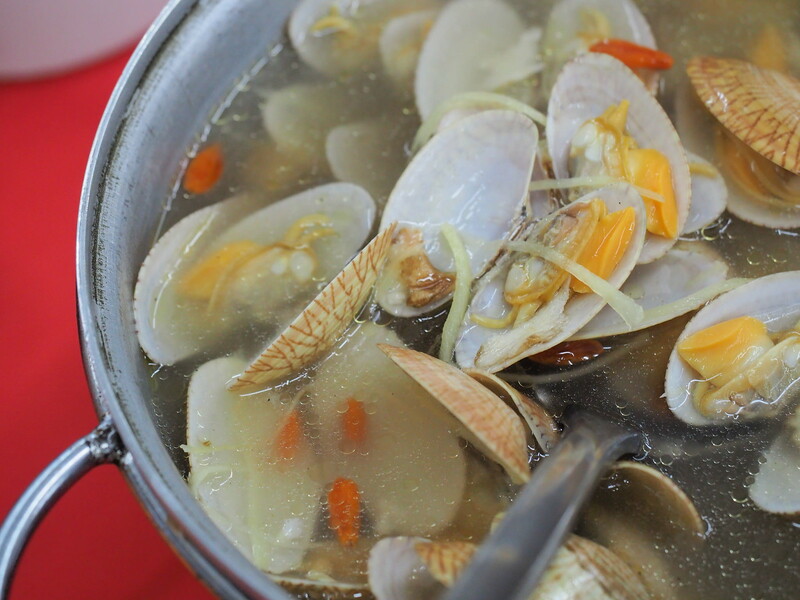 If you are not a fan of Kam Heong style, you can choose lala fried with chili sauce, lala soup, lala mihun or spring onion lala. For us, we always go for lala soup. 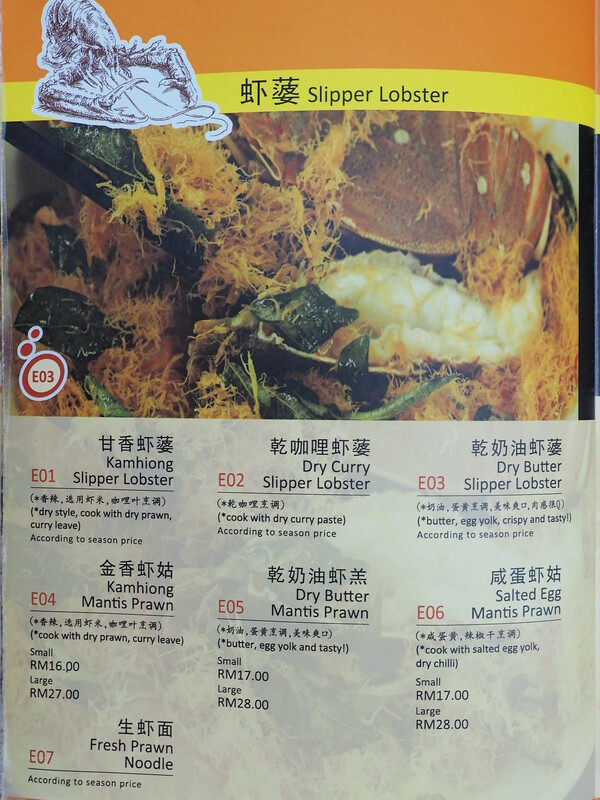 Other types of seafood are the Kam Heong Slipper Lobster, Dry Curry Slipper Lobster, Dry Butter Slipper Lobster, Kamhiong Mantis Prawn, Dry Butter Mantis Prawn, Salted Egg Mantis Prawn and Fresh Prawn Noodle. 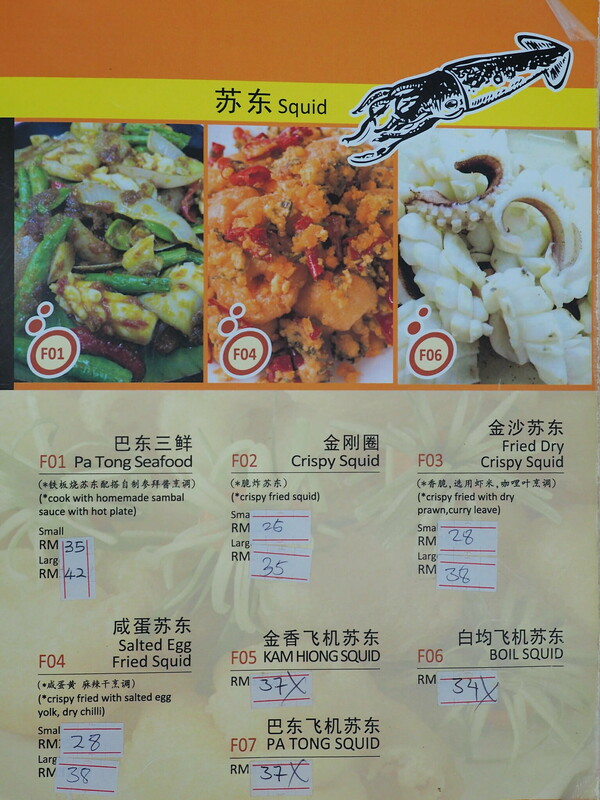 For the squid, there are Pa Tong Seafood, Crispy Squid, Fried Dry Crispy Squid. Salted Egg Fried Squid. Kam Heong Squid, Boil Squid and Patong Squid. The Seafood Beancurd of Pangkor Village Seafood! 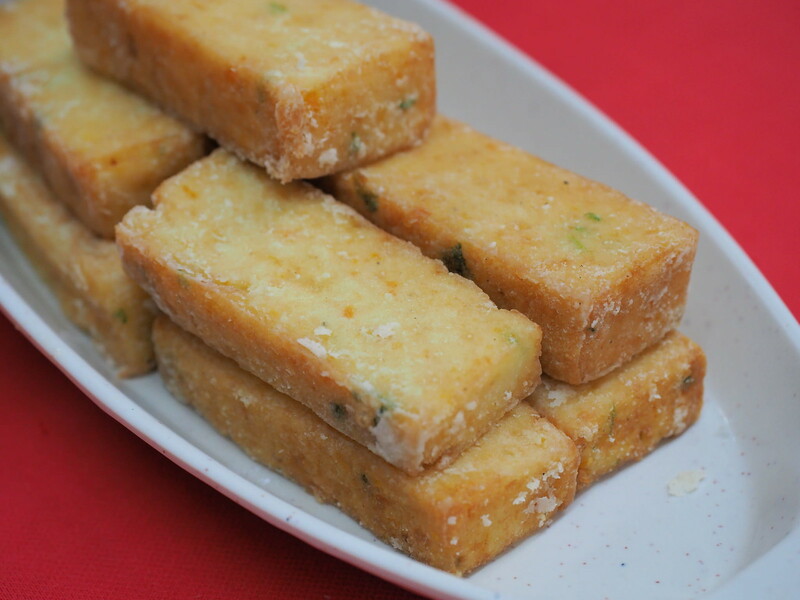 Homemade from seafood and beancurd and it is one of the must eat here in my opinion. Other Beancurd (tofu) styles here are the Teppanyaki Beancurd, Homemade Vegetable Beancurd and Thai Style Beancurd. 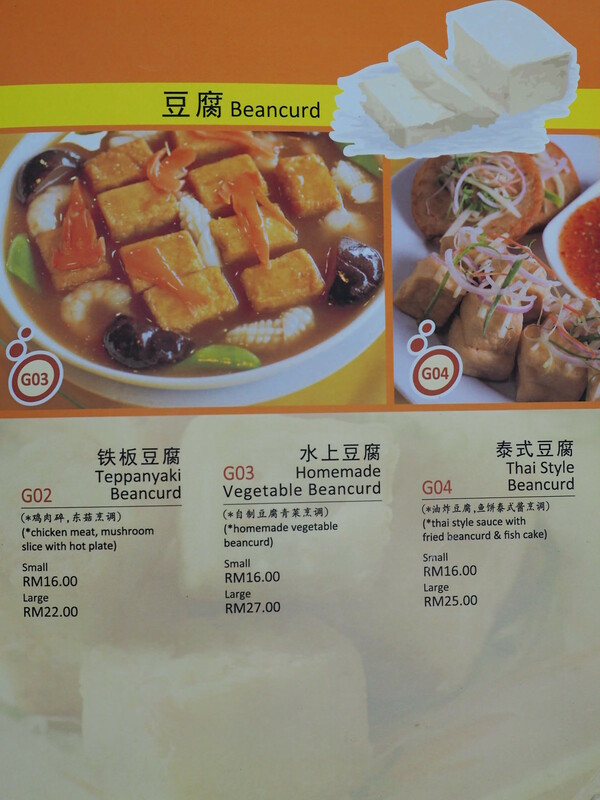 More beancurds dishes here at Pangkor Village Seafood are Special Beancurd, Golden Mushroom Beancurd and Golden Pumpkin Beancurd. All the beancurd are homemade. 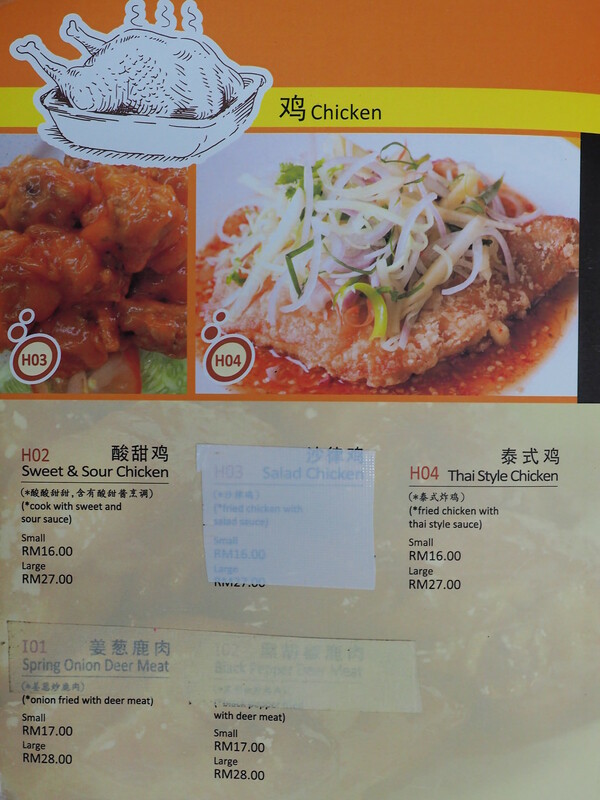 Another dish that is on full page on menu is this honey chicken. 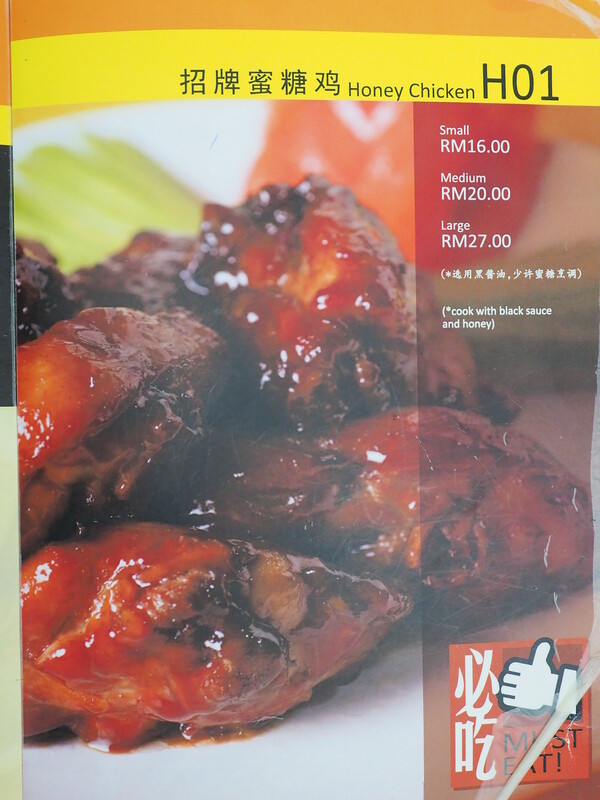 Saw many tables ordered this chicken which is cooked with black sauce and honey. Other chicken cooking styles are Sweet & Sour Chicken and Thai Style Chicken. Deer meat is also available previously. 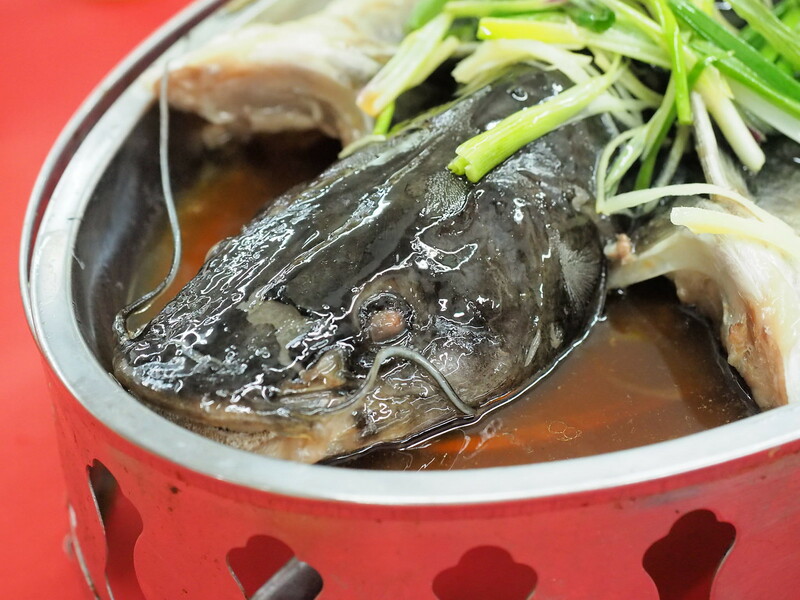 Like many other Chinese Restaurants, there are many styles of fish dishes as well. 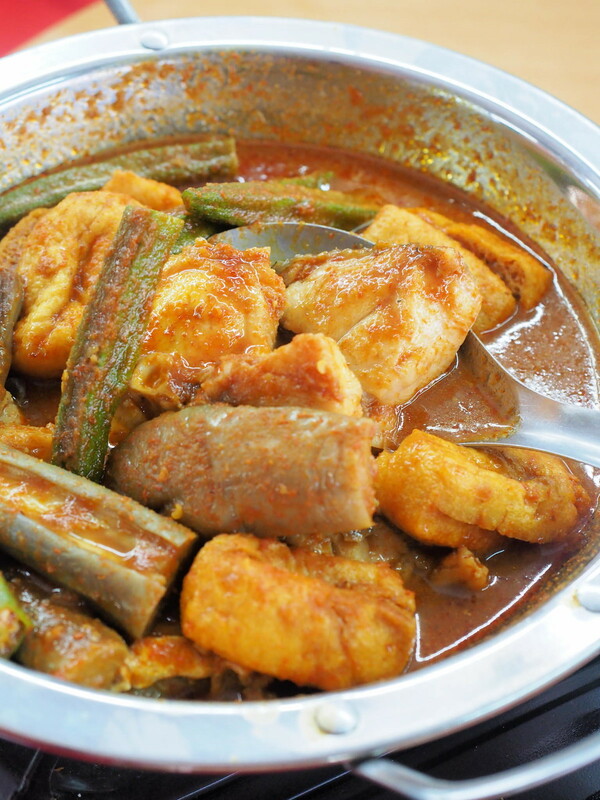 There are Curry Fish, Dry Chili Sauce Fish Head, Steam Fish, Ginger Steam Fish, Teow Chew Style Steam Fish and Sweet & Sour Fish. 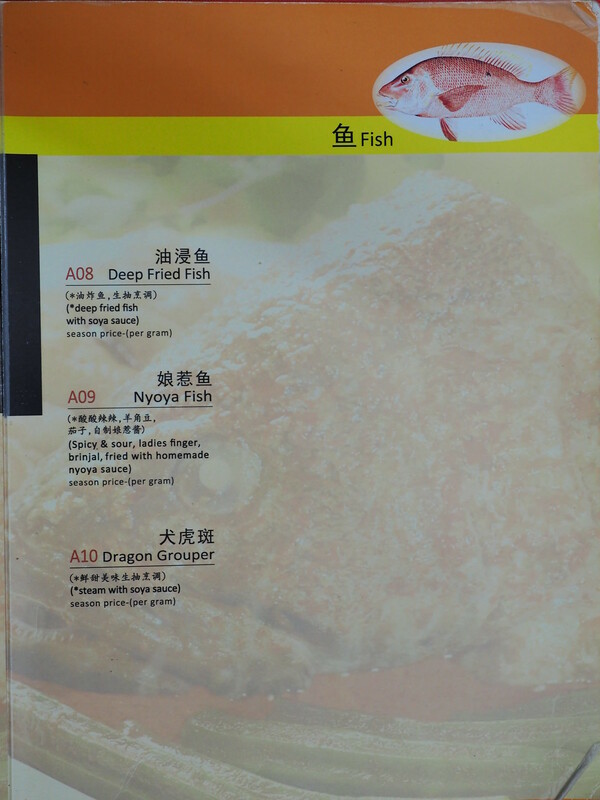 Last 3 types of fish cooking styles are the Deep-Fried Fish, Nyonya Fish and Dragon Grouper. 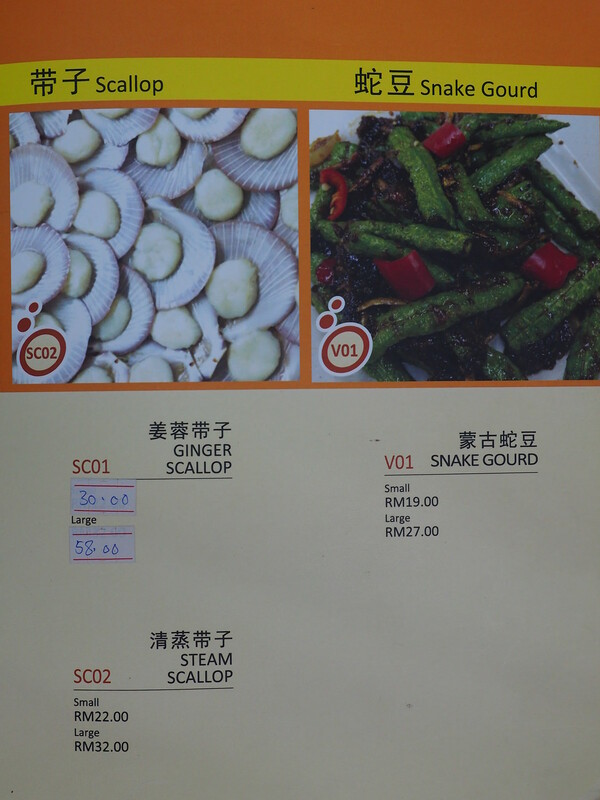 Scallop and Snake Gourd are also available at Pangkor Village Seafood. 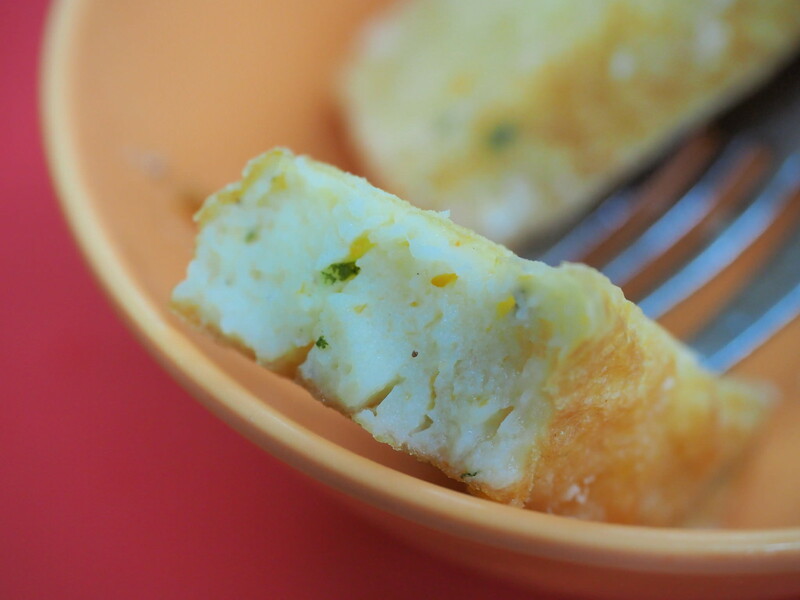 If you are an egg person, there are many types of egg dishes to order from such as Bitter Gourd Fried with Egg and Omelette Egg. There are so many types of vegetables to choose from at Pangkor Village Seafood, but we always order either Kang Kong or Sweet Potato Leave. 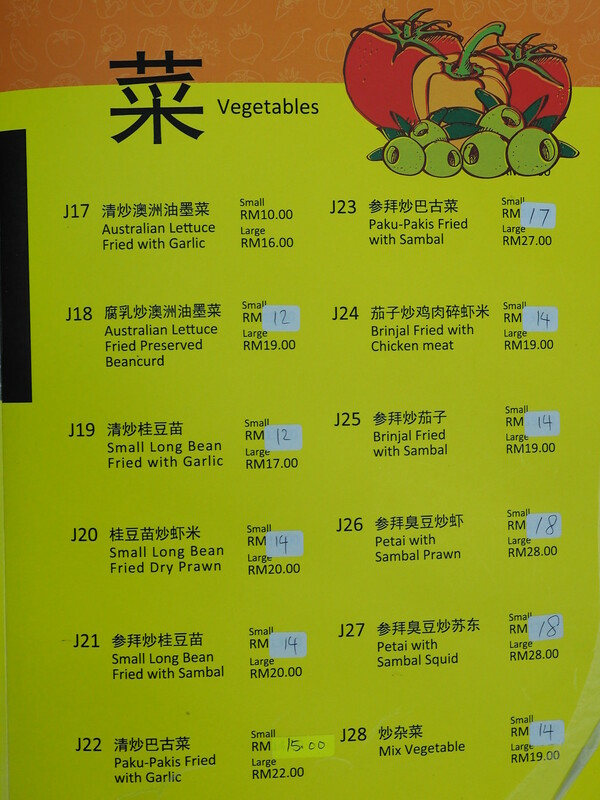 The second page of the vegetables menu. 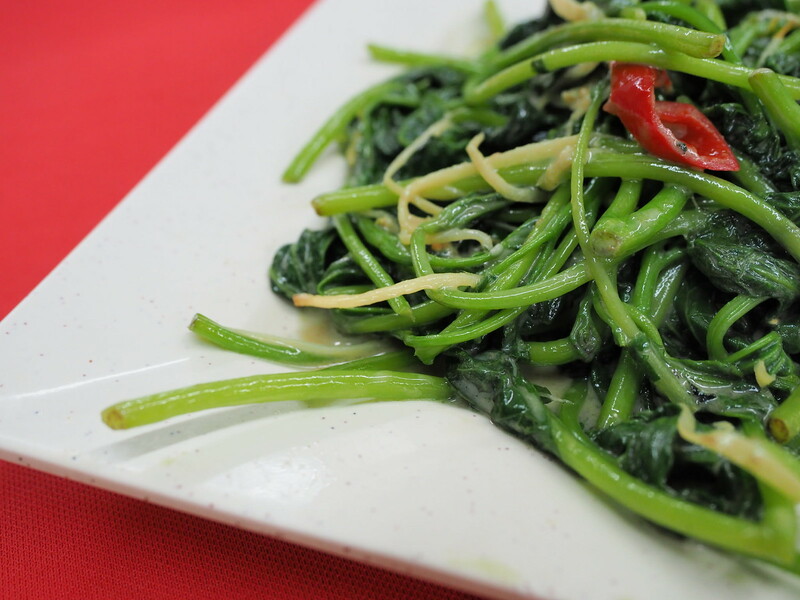 Paku-Pakis is also available here, which is rare among Chinese Restaurant. 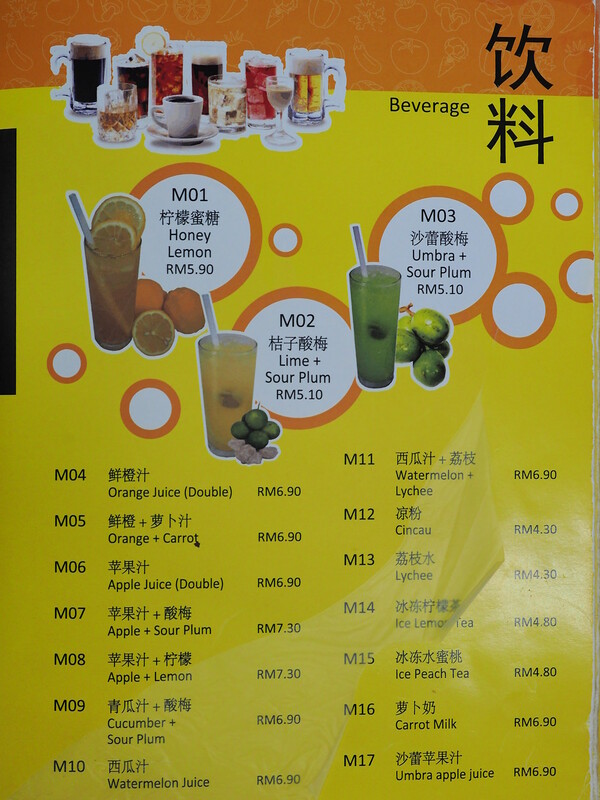 The beverages menu which consists of fruit juices and other standard drinks such as cincau and ice lemon tea. Fresh coconut is quite expensive here at RM 7.90. 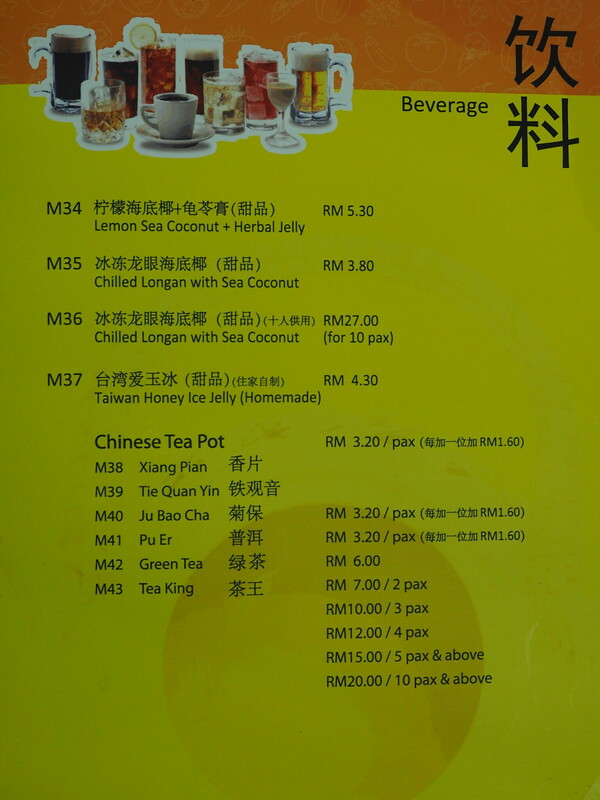 Herbal Jelly is also available for the RM 4.30 per bowl. 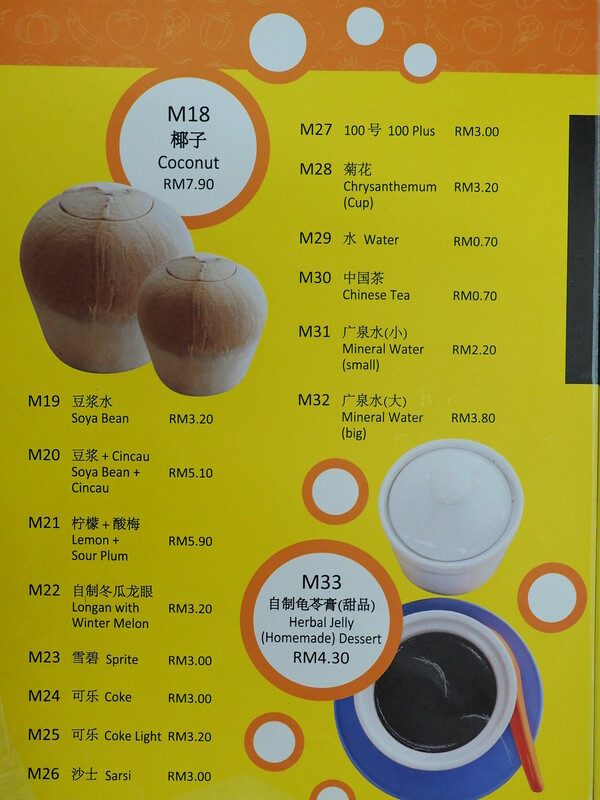 More beverages such as Chilled Longan with Sea Coconut and different types of Chinese Tea. 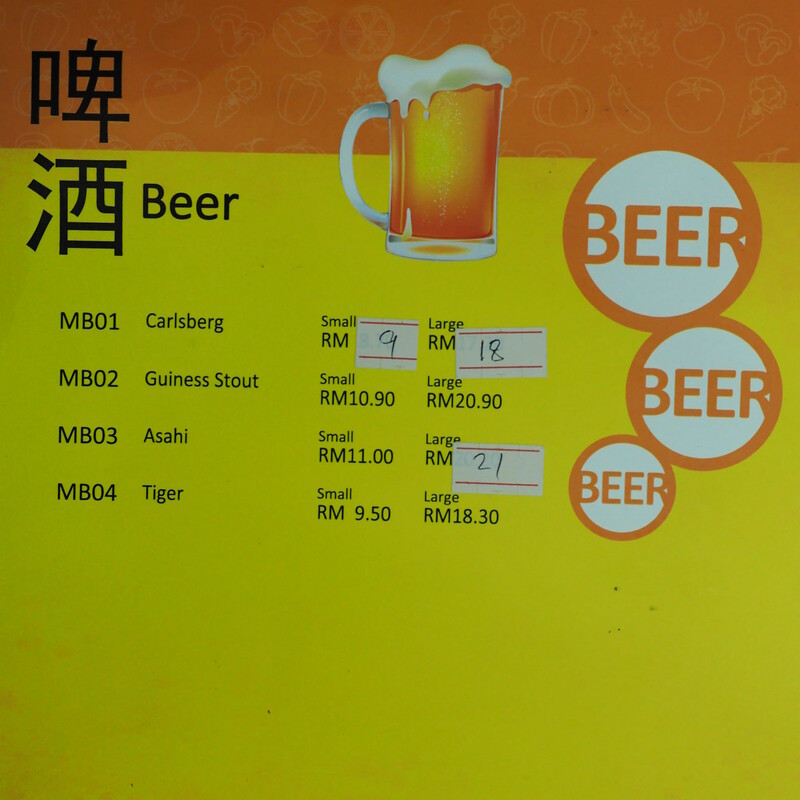 Beers such as Carlsberg and Tiger are also available here at Pangkor Village Seafood Restaurant. 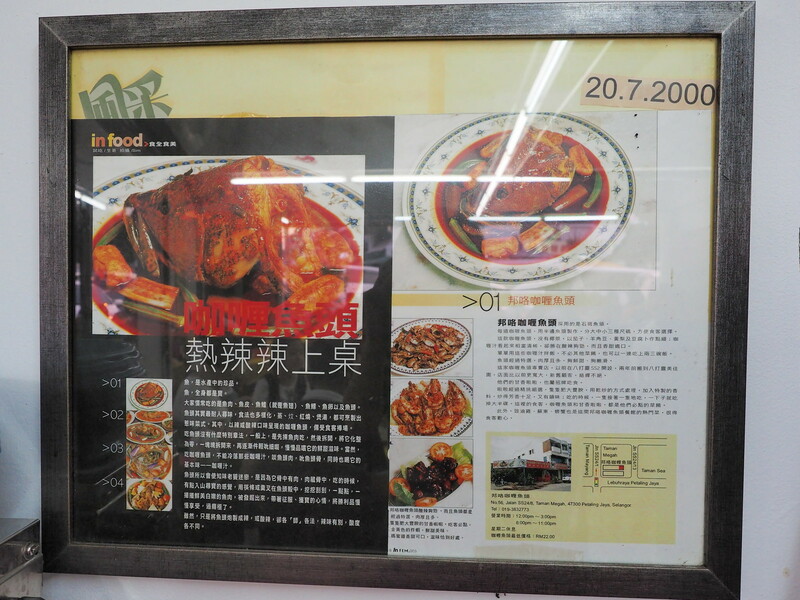 Some of the dishes are featured on the wall inside Pangkor Village Seafood Restaurant. More featured dishes such as the Fish Head Curry. If you don’t know what to order since there are so many types of dishes, maybe you can start from those. 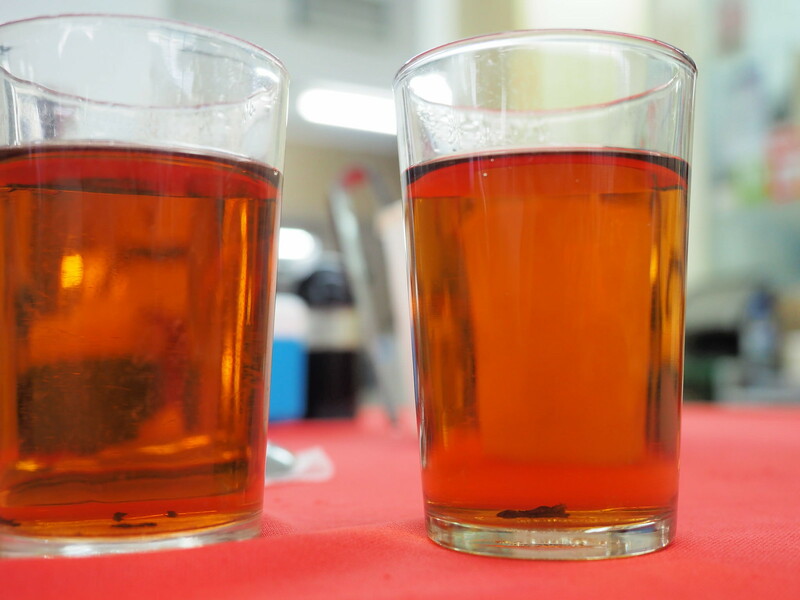 Just our glasses of Chinese tea to wash away the oil from the meals. Chinese newspaper cutting featuring Pangkor Seafood Village. How about some lessons on fish names? 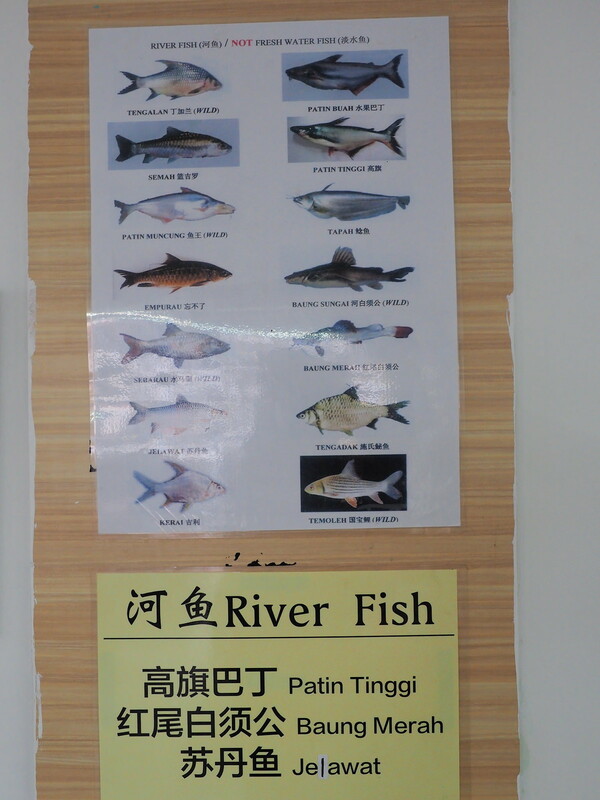 So far, I have only tasted Patin, Tilapia and Grouper fish in Chinese restaurant. 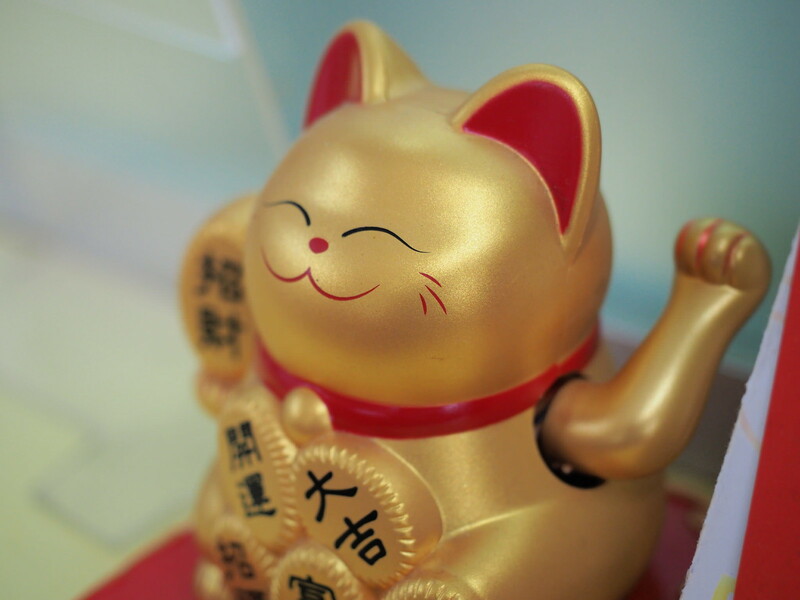 My favourite cat, the Maneki Neko, which will bring more luck and wealth to the owner. 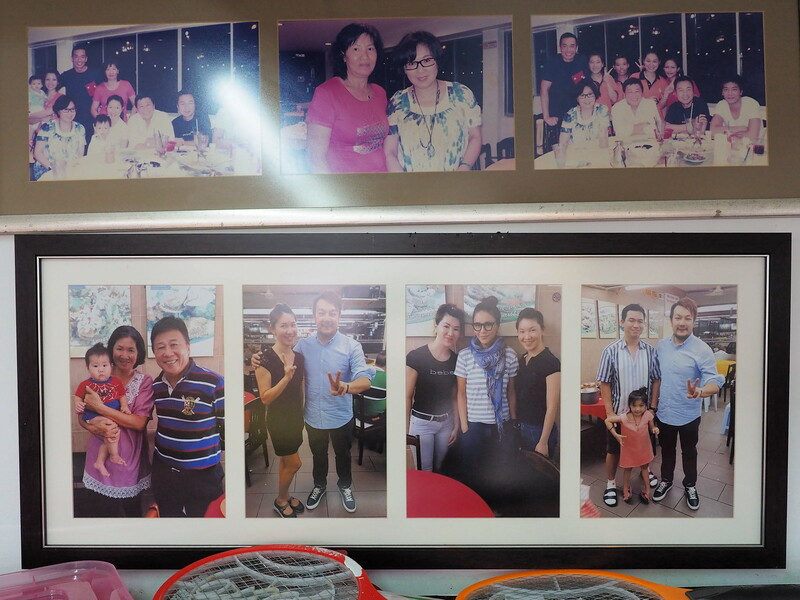 Some of the celebrities, actors and actresses who has visited Pangkor Village Seafood. 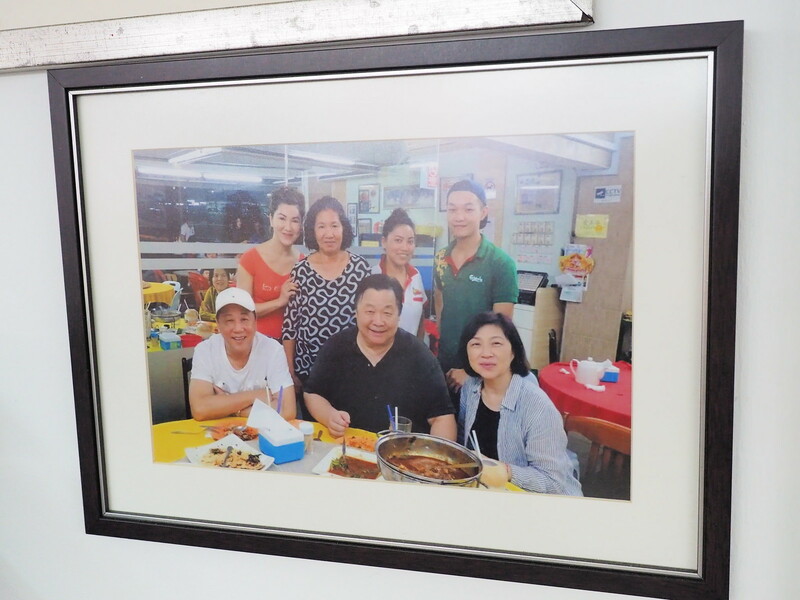 Another photo of Hong Kong actors and actresses enjoying their meal at Pangkor Seafood Village. While waiting for our food to arrive during dinner at Pangkor Village Seafood, I spotted this Fatty Crab Restaurant with super long queue. Not really sure why. 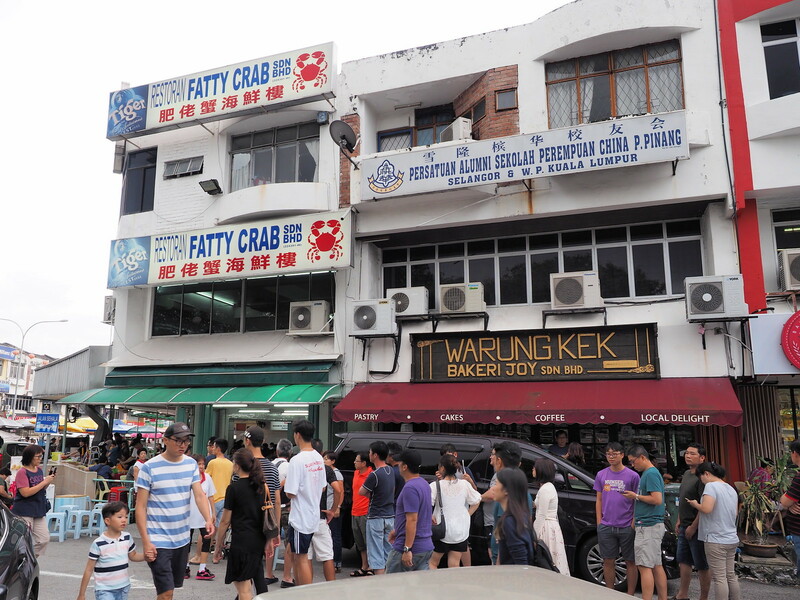 Must find a day to try out this Fatty Crab Restaurant. Pangkor Village Seafood, Taman Megah is located at this corner unit of this shop house. 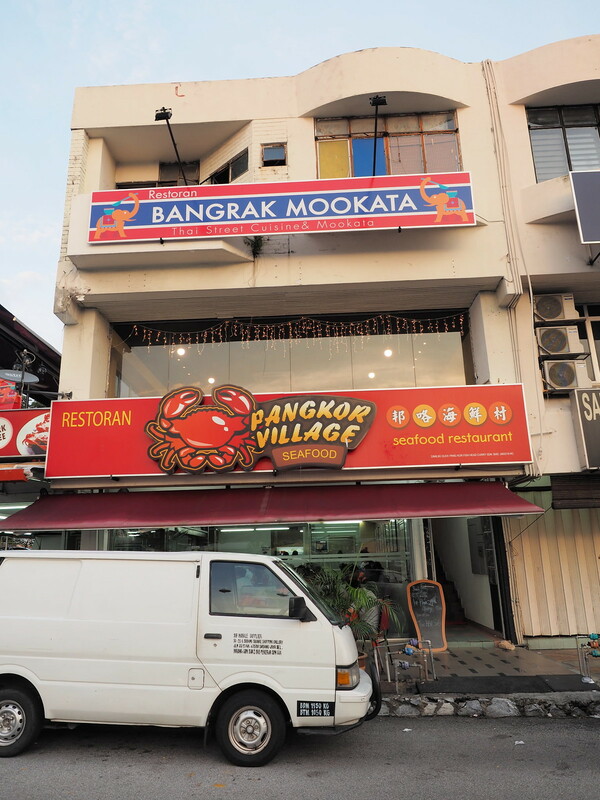 Above is another restaurant with the name of Bangrak Mookata, which is a Thai street cuisine and mookata. 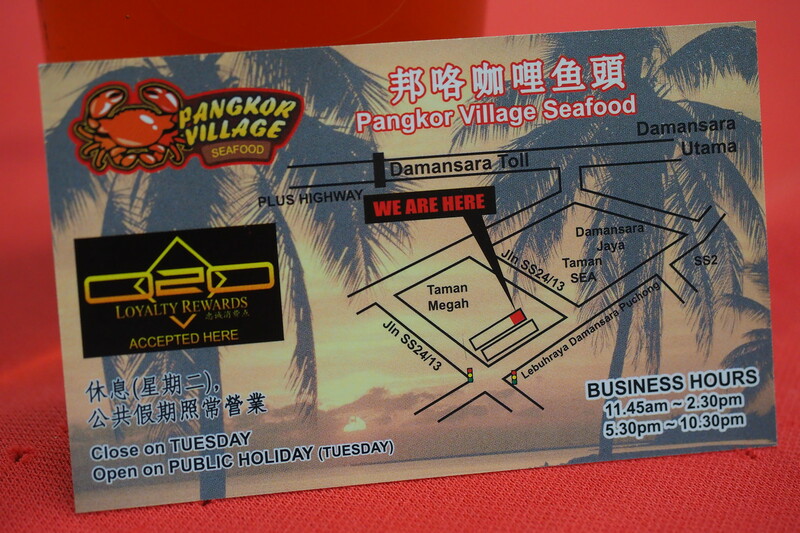 Front side of Pangkor Village Seafood’s name card, showing the address and contact persons for reservation. 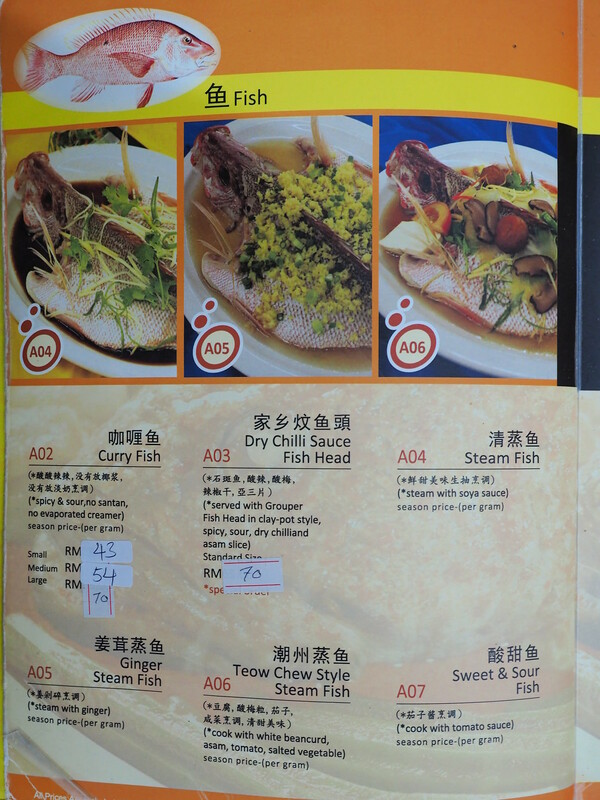 Since they are showing the Curry Fish Head dish on their name card, I guess it is one of their best sellers. The back side of the name card, showing their restaurant location in a map and also the business hour. 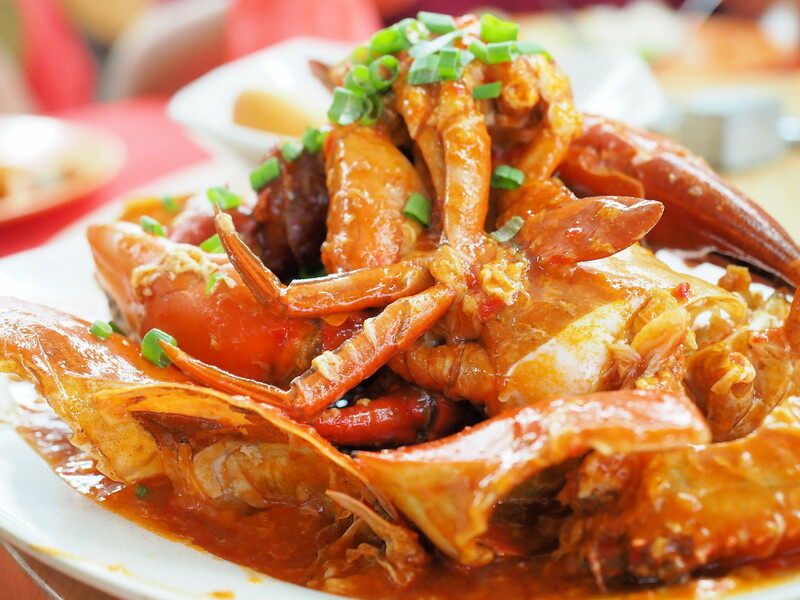 Hopefully, we can come to eat at Pangkor Seafood Village again soon to try their other dishes, especially the Steamed Pondan Crab. There are so many types of dishes here, not really sure how many dinners can cover them all? 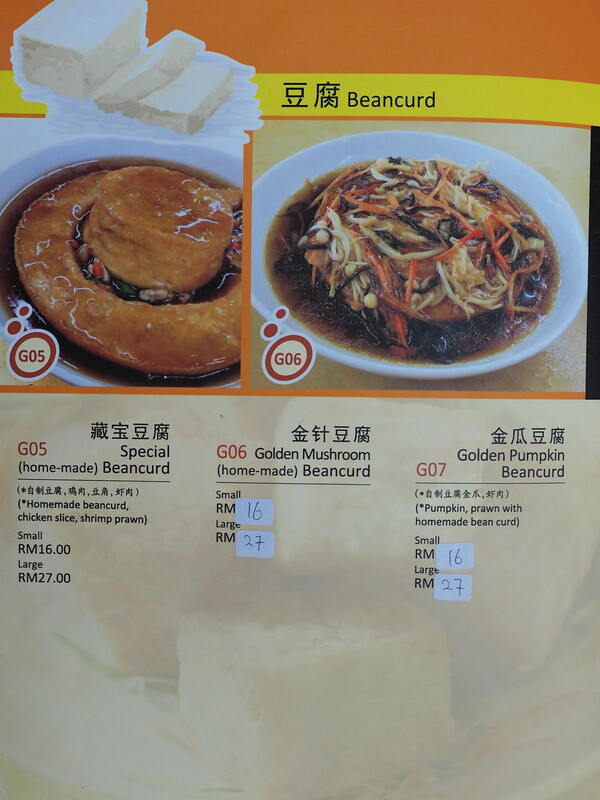 Till then, check out my other Chinese Restaurant blog post and Crab blog posts. 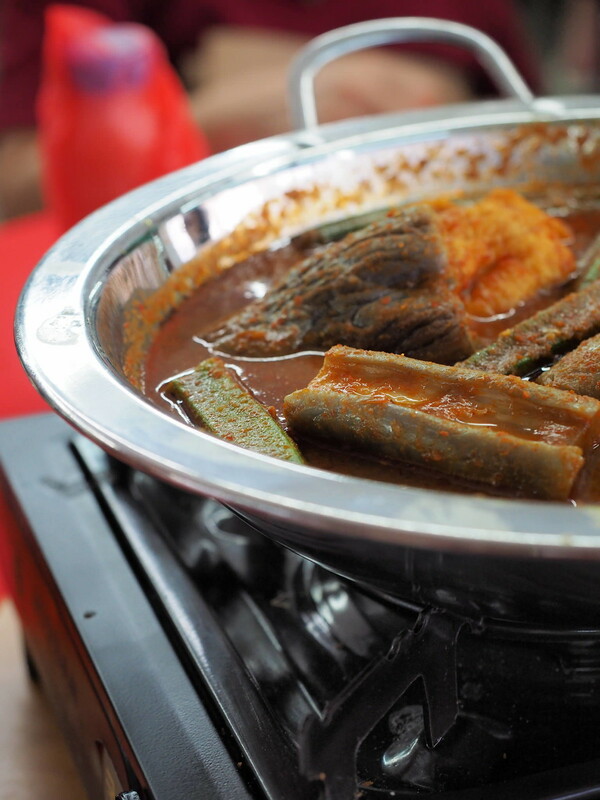 For all photos on Pangkor Seafood Village, please visit my Flickr Album. Loves Crab? Click for my other Crab blog posts. Opening hours: Refer to their Facebook Page for latest business hours. 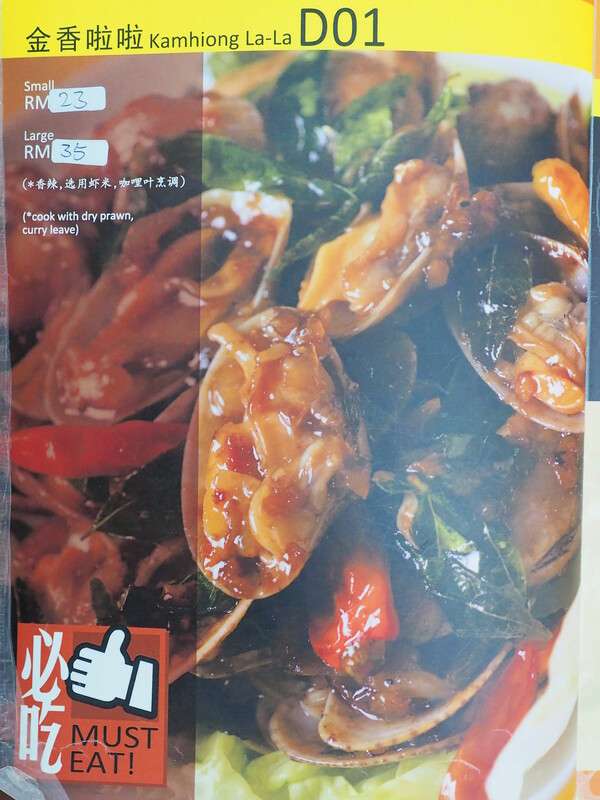 Pangkor Village Seafood is Pork Free but there is no Halal Logo.